The Community Futures Program (CFP) supports rural economic development across Canada through four key activities: working with local partners to advance strategic community planning and socio-economic development; providing business services to small and medium-sized enterprise (SMEs); providing access to capital for SMEs; and supporting community-based projects and special initiatives. In Northern Ontario, the program is delivered by Industry Canada’s Federal Economic Development Initiative for Northern Ontario (FedNor), which provides funding to 24 Community Futures Development Corporations (CFDCs) to support costs related to delivering the four key activities. These CFDCs are independent, arms-length organizations that employ professional staff and are governed by volunteer local boards of directors. In accordance with the Treasury Board Policy on Evaluation and the Directive on the Evaluation Function, the purpose of this evaluation was to assess the core issues of relevance and performance of the CFP. The evaluation covered the period from April 2008 to March 2013. The evaluation findings and conclusions are based on the analysis of multiple lines of evidence. The methodology included a review of documents, a literature review, a review of program and Statistics Canada data, case studies, a survey of clients and interviews with clients and stakeholders. The economic situation in Northern Ontario and the barriers experienced by small businesses in this region suggest a continued need for the CFP. While the need for services varies by community depending on local capacities and the availability of alternate services, the flexibility of the CFP allows CFDCs to target their services in areas where they are most needed. Industry Canada has a clear mandate to deliver rural economic development activities in Northern Ontario under the Department of Industry Act and such activities continue to be priorities of the Government. CFP is also aligned with Industry Canada’s strategic outcomes and activities related to community economic development and developing competitive Canadian businesses and communities. The province and municipalities also provide rural economic development programs in Northern Ontario and while some of their programs may be similar to those offered under the CFP, their availability is often more limited and their eligibility criteria differ. Overall, evidence suggests that CFP is achieving its intended immediate and intermediate outcomes. 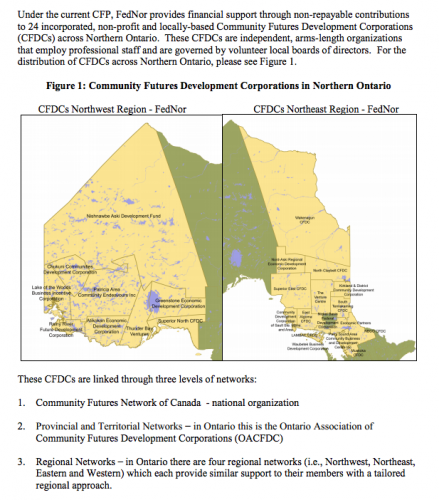 However, some outcomes are partially attributable to the Northern Ontario Development Program (NODP), which has provided funding to CFDCs to capitalize their Investment Funds and support the implementation of community economic development projects. CFDCs primarily focus on providing access to capital and business services, and, therefore, show the greatest impacts through these activities. Ultimate outcomes are difficult to attribute directly to CFP as a number of factors can influence these outcomes; nonetheless, data collected from Statistics Canada and CFP clients suggest that the CFP is contributing to job creation and economically sustainable local rural economies. The program also appears to have had an incremental impact. A Statistics Canada comparison of CFP assisted businesses to matched non-assisted businesses showed that CFP-assisted businesses had higher employment growth, sales growth and business survival rates than non-assisted businesses. Further, a high proportion of surveyed loan clients indicated it would have been unlikely that they would have been able to start or expand their business in the absence of the CFP loan. The delivery of the CFP is efficient in that the program’s flexibility allows CFDCs to focus on activities within their communities that will have the greatest impact. While the loan component has been efficient in achieving leveraging, the overall loan loss ratios are low and cash reserves held by some CFDCs are high. There is an opportunity for FedNor to explore why this is occurring and determine whether further action is required.